Jamsetji Nusserwanji Tata was an industrialist, humanist, nationalist and a nation builder. He was born on March 3, 1839, in Navsari in Gujarat, into a family of priests, the eldest child of Nusserwanji Tata. His father moved to Bombay (now Mumbai) to do business and when Jamsetji was 13 he joined his father and enrolled at Elphinstone College, from where he passed out in 1858 as a ‘green scholar’ (the equivalent of today’s graduate). He joined his father’s business gaining knowledge about commodities and markets, trading and banking. In 1868, at the age of 29, he started a private trading firm called Tata and Sons, thus laying the foundation of what is now known as the Tata group. He built his business on five core values – Integrity; Understanding; Excellence; Unity; Responsibility. These values continue to direct the growth and business of the Tata group. Jamsetji believed in nation building and sought to give India what he felt was necessary for its economic progress – a steel plant and ‘clean, cheap, abundant power’ – hydroelectricity. His dreams were realised by his sons when the Tata Iron and Steel Company (now Tata Steel) was set up in 1907 and Tata Power in 1910. 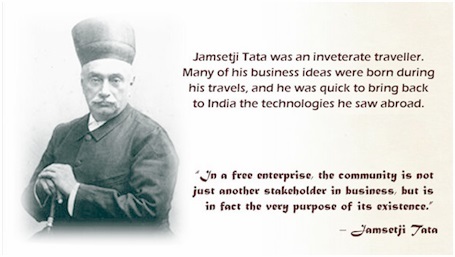 Jamsetji’s ideas and vision went beyond business. He was a philanthropist who believed in selfless giving and his philosophy of constructive philanthropy became a tradition for the Tata group. He realised that India needed a technologically proficient generation and established the JN Tata Endowment Scheme for higher education in 1892. Another of his dreams was that India should have an institution of advanced scientific education and research. In 1898, he pledged Rs. 3 million — half of his personal fortune — towards setting it up. The Indian Institute of Science in Bangalore (now Bengaluru), helped to create and nurture India’s atomic energy programme and space programme. It also enabled CV Raman to undertake research in light scattering, which eventually won him the Nobel Prize in 1930. Jamsetji Tata’s sons, Dorabji and Ratanji, inherited his spirit of selflessness and nationalism and developed it even further. They set up major trusts using their own finances. Sir Dorabji Tata left most of his personal wealth (around Rs 10 million) to the Sir Dorabji Tata Trust, registered a few months before his death. The Sir Ratan Tata Trust was established in 1919 in accordance with Sir Ratan Tata’s will. Other trusts have been set up at different times to support charitable causes or aims or objects. These philanthropic trusts have created national institutions in science and technology, medical research with a special focus on cancer research, diagnosis and treatment, social studies and the performing arts. They also support organisations working in areas impacting social and sustainable development such as management of natural resources, education, healthcare, environment and livelihood. Jamsetji’s vision, his philosophy and values continue to guide the Trusts in their endeavour to make a meaningful difference in the lives of the people they touch.